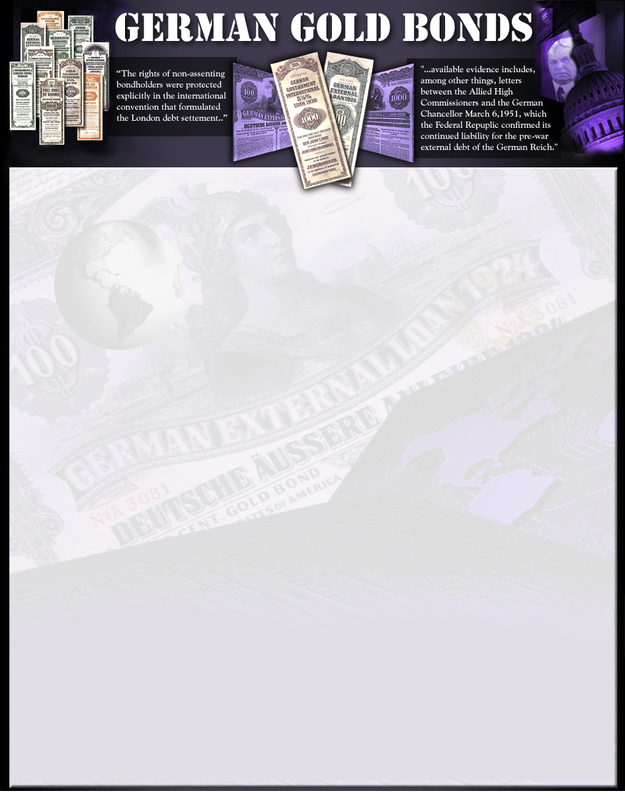 German Gold Bonds” is a title that has been given to a select group of 85 different bearer bonds that were issued between the years of 1924 and 1930 by the German Government and entities within Germany. This specific series of these bonds were all sold in the U.S. by American banks/brokerage houses and were all denominated in U.S. Gold Dollars. The short story regarding these bonds starts with the fact that in the 1930's all of these bonds went into default. Then in 1953 a Treaty was signed whereby the post WWII Germany would take responsibility for payment of these bonds but people who wanted immediate payment (“assenting bondholders”) had to jump through hoops before getting paid. Those who did not want to, or could not, jump through the hoops (the “non-assenting bondholders”) had to wait until 1994 before being allowed to press a claim against Germany and/or the original issuers for payment. Since 1994 Germany has hidden behind internal German laws to delay making payment to the non-assenting bondholders. Since then seven different lawsuits have been filed in U.S. district courts against Germany that have uncovered an ongoing fraud removing statute of limitation concerns and opening the doors to additional suits worldwide.. This site provides information about these cases and our newsletter will now provide ongoing new information being discovered about these bonds, their uses and efforts to obtain value from them. This site also offers information about a trilogy of books regarding these bonds starting with the book that blew this lid off this story - "The German Financial Time Bomb.". For decades the misinformation about these bonds have aided scam artists and federal agencies alike to fool the uninformed into giving up either their money or their bonds and many have ended up in jail over them. Nevertheless the truth is finally coming out. Hopefully the madness will stop and the issuers will finally accept that they did receive huge sums of money from private American citizens that they have never repaid and the time has come to pay up.